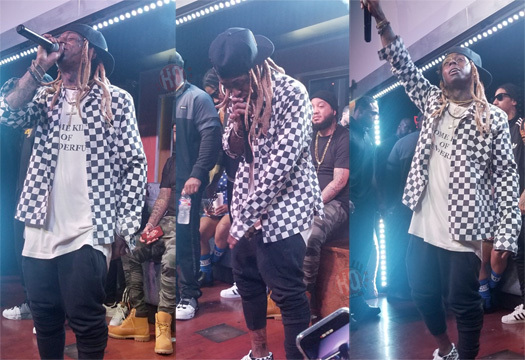 Here are some awesome pics of Lil Wayne hosting a 2018 NFL Draft Weekend Finale event at Pryme Bar in Dallas, Texas on April 28th. 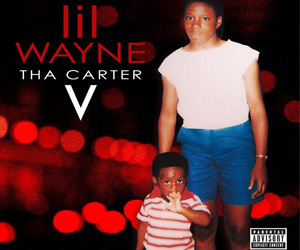 At the party, Weezy watched a sports game on TV with Kisha Jackson next to him, as well as put on a live show for everyone in attendance. You can view more photos of Tunechi chilling and performing live at Pryme Bar after the jump below, courtesy of Duuby Bee IRM and Poet! 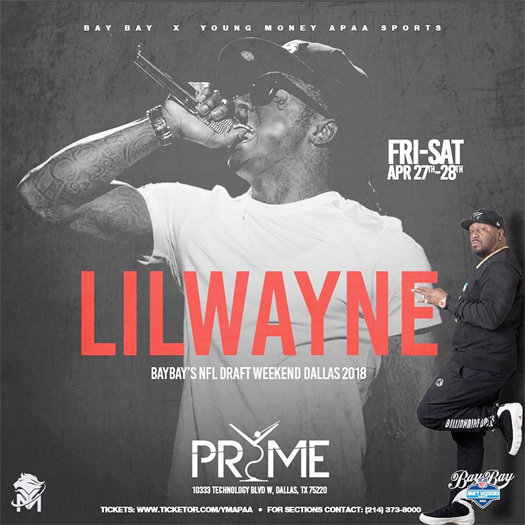 I previously posted up some footage of Lil Wayne performing live at his 2018 NFL Draft Weekend Finale party just over a month ago, and now we see some footage of Wayne at Pryme Bar in Dallas, Texas on April 28th. 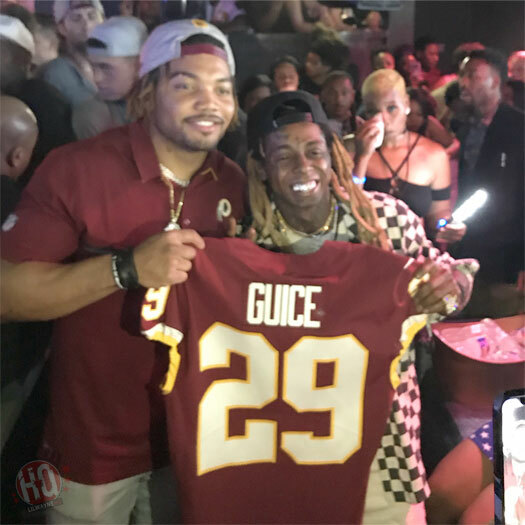 In the clip, Weezy can be seen chilling in the nightclub with Kisha Jackson, Nicole Lynn, Mack Maine, Gudda Gudda, Marley G, and HoodyBaby watching a game on television, as well as greeting his Young Money APAA Sports clients Derrius Guice and Dede Westbrook. You can watch some footage of Tunechi at Pryme Bar in Dallas after the jump below! 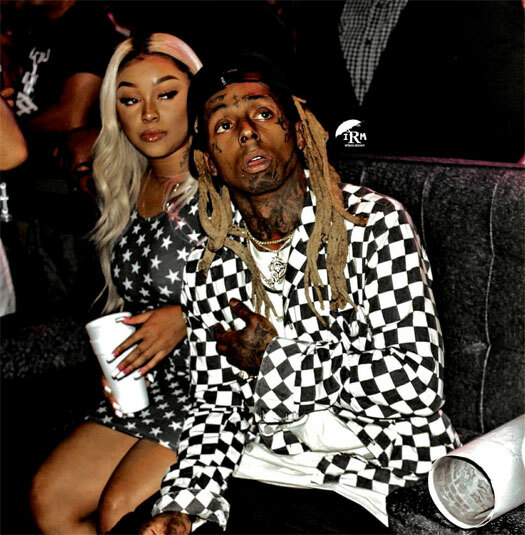 On April 28th, Lil Wayne and his Young Money Sports agency hosted a 2018 NFL Draft Weekend Finale party at Pryme Bar in Dallas, Texas. 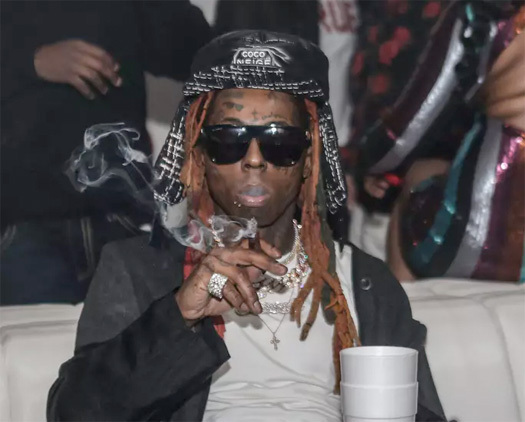 During the event, Weezy got on the mic to perform “John“, “Go DJ“, “A Milli“, “Loyal“, and “Steady Mobbin’” live on stage with Young Mula‘s Mack Maine, Marley G, Gudda Gudda, and HoodyBaby all behind him. You can check out some footage of Tunechi performing live at his NFL Draft show in the clips after the jump below. Enjoy! This Saturday on April 28th from 10:00PM until 3:00AM on the Sunday (April 29th), Lil Wayne is going to be in Dallas for the 2018 NFL Draft Weekend Finale. 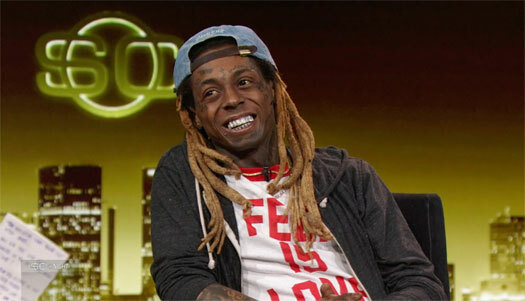 Tunechi and his sports agency, Young Money Sports APAA, will be hosting an event at Pryme Bar in Texas. 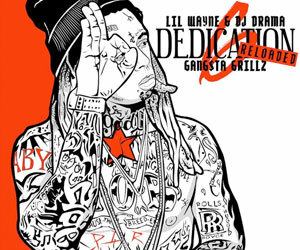 If you wish to attend the party and see Weezy live, click here to order your tickets online!